Grammar schools dominate the league table of 14 year olds' test results in England. They top the ranking for "raw" results - but also the one showing the newer "value added" measure. This measure is a number based around 100 - higher being above average, lower being below. It is intended to show how much pupils improved between this year's tests and those they took at the age of 11, at the end of primary schooling. Teachers' organisations argue that the methodology is flawed and the tables are an irrelevance. The Department for Education and Skills says the smaller the number of pupils taking the test, the less confidence can be attached to the score. For schools with 50 pupils or more, scores of 99.2 to 101 are "broadly average" - where there are 100 pupils or more, scores of 99.5 to 100.7 are broadly average. A score of 103 and above puts a school in the top 5% of schools nationally whereas 97.5 or less is in the bottom 5%. Skegness Grammar School in Skegness, Lincolnshire, led the table with a score of 104.2. At the other end was Addington High School in Croydon, south of London, with a score of 95.4. 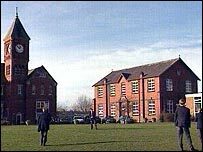 Skegness Grammar's head teacher, Andrew Rigby, said the government should now scrap the legislation which allows campaigners to force local ballots on the future of selection. The law - which pro-comprehensive campaigners regard as weighted against them - has been used only once, in Ripon, where parents voted to keep the 11-plus. Mr Rigby said it was time to remove the threat because the tables showed grammars gave a good education. "I feel that if grammar schools are well represented in the upper reaches of the value-added league tables it proves we are doing a good job, and not just because we have the advantage of a selective intake," he said. "We are delivering the goods with aplomb."